I’m in Munich for two weeks, Starnberg to be precise, a small town (pop. 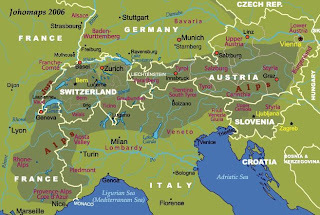 23,000) southwest of Munich near the feet of the Alps, the famous mountain range stretching through eight states. 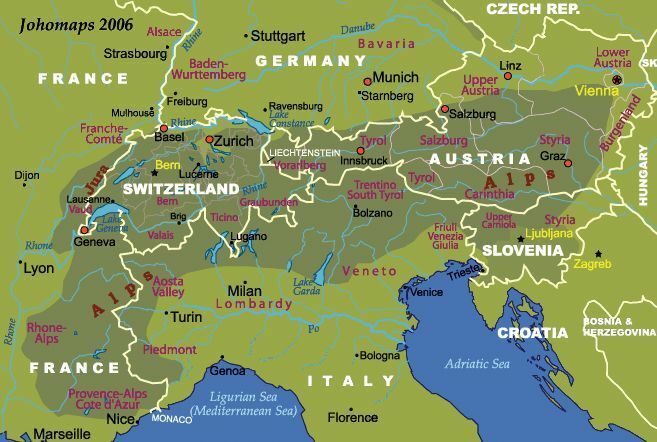 To most Americans as well as Europeans, Alpine architecture brings up a bucket of cliche images: romantic little mountain huts on steep slopes with wood-shake roofs, an al-fresco painting of a hunter in Lederhosen on the front wall, low-ceiling wood-paneled rooms with tiled ovens burning fragrant firewood, Heidi. Form follows function, and every element in Alpine architecture we’re familiar with actually has a functional origin. 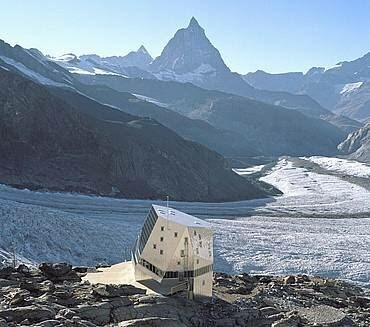 But as construction methods, possibilities, materials and climates evolved, so did Alpine architecture. The amount and quality of modern buildings you can find in the mountains today will astound you. During my research I discovered that modernism in the Alps is so plentiful I could easily write about it for several months. Hotels, spas (which are typically elaborate baths built over and around hot mineral springs, not what an American may associate with a “Day Spa”), museums and even supermarkets not only win prizes, but also enjoy the highest reputation among architectural experts. 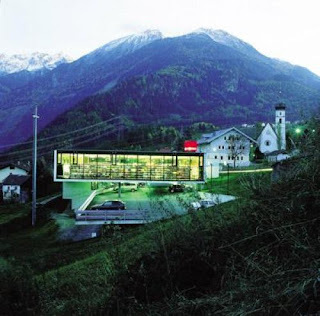 Whether locally renowned or international names such as Peter Zumthor, Norman Foster, Mario Botta or Zaha Hadid - in the Alpine region, modern architects show what they are capable off. Therme Vals; Vals, Switzerland. Spa and hotel built over a hot mineral spring, completed 1996. 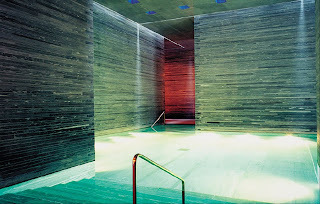 Architect: Peter Zumthor, Basel. 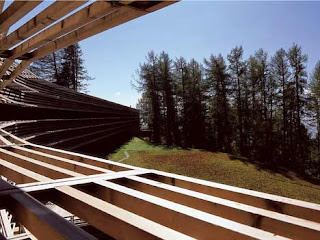 Vigilius Mountain Resort; Lana (Italy). Hotel, completed 2005. Architect: Matteo Thun, Milano. Cost: 20m Euros. Monte-Rosa-Hütte; Zermatt, Switzerland. Hostel for mountain climbers and hikers with restaurant, completed 2009. 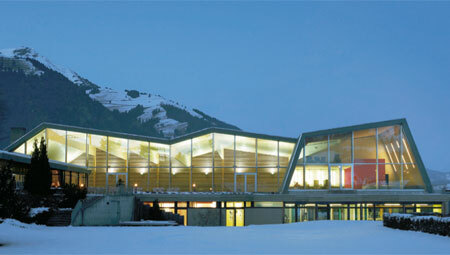 Architect: Cooperation ETH Zürich - SAC - Hochschule Luzern - Technik & Architektur EMPA. Kirchnermuseum; Davos, Switzerland. Museum dedicated to German expressionist Ernst Ludwig Kirchner, completed 1992. Architect: Gigon Guyer Zürich. Hallenbad; Frutigen, Switzerland. Public swimming pool, completed 2008. Architect: Itten + Brechbühl, Bern. Cost: CHF 6.7m. Festspielhaus; Bregenz, Austria. Concert hall renovation and expansion, completed 2006. 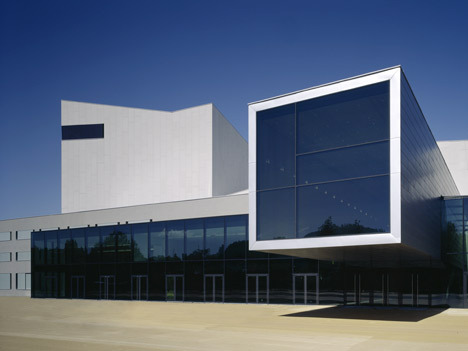 Architect: Dietrich/Untertrifaller, Bregenz. Cost: 40m Euros. MPreis-Supermarkt; Wenns, Austria. Supermarket (one of a chain, each designed by a different architect), completed 2001. Architect: Köberl & Tschapeller, Innsbruck. Bergisel-Schanze; Innsbruck, Austria. 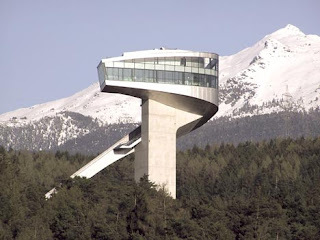 Ski jump with cafe and viewing terrace at 130 feet (40 meters), completed 2002. Architect: Zaha Hadid, London. 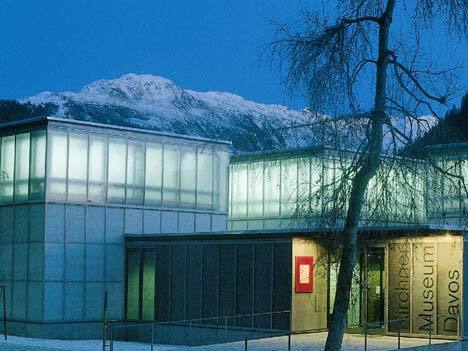 Next time: more Alpine modernism, including Foster’s peanut, another spa-interpretation, and a museum with village fire station and concert hall.